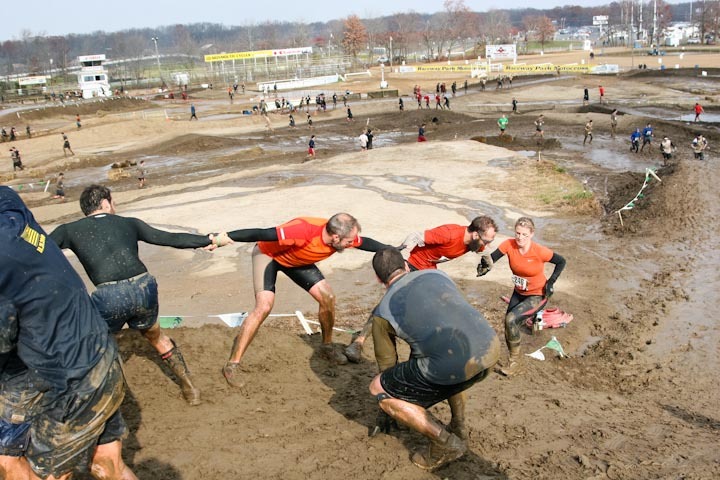 I know a lot of people who say they would never consider doing an obstacle course race. They have all sorts of reasons, too. You know what? 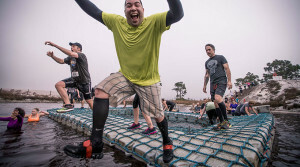 Those are exactly the reasons you SHOULD do an obstacle course race. I believe that most people need to be shocked out of their complacency with the status quo to get somewhere they really want to be in life. Most people go through life and accept what is handed to them because “it’s the way things are.” You have to get a house, get a job, go to school and get a degree, etc. Your status in life is decided by your success within the standards that have been set by centuries of modifying the natural order of things. We no longer think we can do things that wouldn’t have been thought twice about thousands of years ago. Here’s the thing, though: from an evolutionary standpoint, we’re not significantly different than our pre-agricultural ancestors. Our bodies are capable of lots of stuff that we don’t even realize. But let’s face it – in a world where we’re constantly told just how fragile we are and how easy it would be to hurt ourselves or get sick (mostly by pharmaceutical companies that are looking for us to constantly pop pills and make them rich), it’s hard to get past our fear. Personal development guru Anthony Robbins is famous for his creation of “Neuro-Associative Conditioning (NAC).” This is his system of overcoming the two innate desires of the human mind. These desires are to seek pleasure, and to avoid pain. It sounds pretty simple, doesn’t it? And it is. The problem arises when these two desires begin to interfere with improvements in our lives because of the fear of not accomplishing both of these things. Know What is Preventing You From Getting What You Want. Interrupt that Pattern or Break the Old Behavior, Remove the Obstacles. Choose and Install the New Behavior or Pattern You Want. Condition Yourself for the New Behavior or Pattern. Conditioned It To Be Your New Automatic Response. These can be some really introspective ideas, as you can see. You really have to do some soul-searching to figure out what it is that you want and what is preventing you from getting that. And it isn’t always as simple as “lose weight” or “get in shape.” You need to go past that and figure out WHY you want to lose weight or get in shape. And then, you have to sit back and figure out why you haven’t done this before! Asking a lot of questions of yourself and getting to the root of your fears (in Step #2) is key to getting ahead in life and breaking through the problems of your past. And then there’s #3: interrupting the pattern. That’s where Obstacle Course Racing comes in. Thousands, if not millions, of people all over the world have tried out obstacle course racing and have significantly changed their lives with it by completely shattering that concept of what they think they can do. Running out into the woods, up and down hills, crawling through mud and climbing ropes and getting shocked by live wires and wading through ice water and such doesn’t seem like a natural act. For most people it’s definitely not something they associate with seeking pleasure – and as a counter, they definitely feel they’re avoiding pain by staying in their homes or offices and not seeking out ways to challenge themselves. Perhaps they’re heard all their friends and co-workers talking about how they have all these awful aches and pains that are “just part of getting older.” This is BS, naturally, but it’s hard to get past the conditioning they’ve received. Or they’ve stopped doing the things they love like hiking, running, climbing trees, and just playing because it’s not an adult thing to do and they don’t want people to think they’re “weird.” Or they’d like to get healthier but they’re afraid of the feedback they’re going to get from family and friends who are afraid to let them be more successful than they are (and this is a real thing – many people don’t like to be reminded by the people around them that they could do better). Doing something like an obstacle course race can be just that transforming event that shatters all those pre-conceived notions. You can learn that those aches and pains can be overcome by eating properly and exercising correctly. You can re-experience those great activities you loved as a kid and realize that you don’t ever have to give them up because they’re doing great things for you, inside and out. And you can get around a group of people who admires and encourages you to reach for greater things because they want you to achieve great things for yourself. Steps 4-6 above can all be the results of a really positive step 3. Obstacle Course Racing provides all this and more. Many races have workout plans and nutrition suggestions to help you overcome those aches and pains. They provide a regular playground for just getting out and being a little bit kid-like and crazy. And the whole course is taken up by people who want to help you get through and shatter your preconceived notions. OCR people WANT YOU TO SUCCEED. I know a ton of people who have changed their lives for the better just by taking on one obstacle course race and seeing what happened after that. You might be a person who does one and that’s enough. You might be like me and want to keep on doing them as long as you can. But I encourage you to sign up for one now and try it out. You never know the breakthroughs you can make just by taking that one big leap of faith.